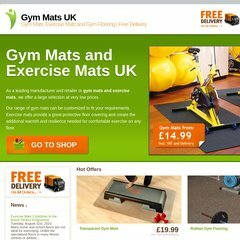 Topics: Go To Shop, Gym Mat Guide, A Step Beyond Exercise Mats, Transparent Gym Mats, Rubber Gym Flooring, and Exercise Mats. dailymail.co.uk Kangoo: The workout that will literally turn you into a gym bunny! Its 2 nameservers are ns52.ukhost4u.com, and ns51.ukhost4u.com. It is hosted by Ukhost4u (Scotland, Kirkcaldy,) using Apache web server. The site is programmed for PHP/5.3.21. PING (188.64.184.61) 56(84) bytes of data.